Use Pinterest to help you get organized and inspired with your home design and improvement projects. Most people think of tools such as hammers and nails for home improvement and design projects. But you should also be thinking of tech tools such as apps to help you get such jobs done. Whether your plans are large or small, apps can help you with inspiration and organization. You may even save time and money using them. Some apps can show you images of how your design ideas might look in your home before you even carry them out! One popular design app is Houzz. The Houzz app helps plan home design and improvement projects. Users can search by room, style and more, then see over 10 million photos in the app. Moving to a new city? You can search Houzz photos to get an idea of decorating styles in your new area. You can shop for products from within the app and be alerted to sales. The View in My Room feature uses augmented reality to show you how furniture would look in your home. Houzz lets users save items in lists to help find them later. Lists can be shared with others to help teams work together on a project. The app also has articles and videos to give ideas for home projects. Houzz can help users find professionals for remodeling projects. The app lists local contractors, designers, architects and swimming pool builders. Houzz is free for iPhone, iPad, Apple TV, Android, Amazon Fire tablets and Microsoft. Links to the apps are at the Houzz website. 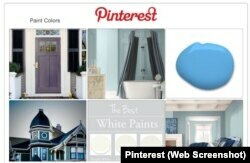 The Pinterest social media app can help give you design ideas and keep those ideas organized. Create boards of paint colors to help choose a perfect shade. Pin images with hues you can compare to others later. ​Search for design ideas. Looking to create a home theater? Search for “home theater" on Pinterest to see others' designs. You can get ideas by following boards by paint companies, furniture stores and home decorators. When you are choosing paint colors, you may have difficulty imagining which color would look best on your walls. Apps can help show how a color would look in your home before you buy a can of paint. The Dulux Visualizer app can help you choose a color. Use your camera or a photo on your phone to match a color you like to a paint color. Then use your camera within the app to get an idea of how that color will look in your home. The app uses augmented reality to provide an image. It can also show you paint colors that will go well with the colors in your furniture. And, you can order paint samples through the app to be sent directly to you. The Dulux Visualizer app is available free for iPhone, iPad and Android in Britain. You can download the app from the Dulux website. For the U.S., Benjamin Moore Color Capture app and the Color Snap Visualizer app from Sherwin Williams. The next app won a “Best Design and Decorating App 2017” award from the magazine Architectural Digest. Color911 was designed by professional color consultant Amy Wax. Color911 can help match colors from a photo on your phone or on the Internet. You can create your own color palette in the app, or find palettes others have created. The app comes with over 100 color themes, each with 36 different colors. The app lets users adjust colors for hue, saturation or brightness. You can share your palette with others. 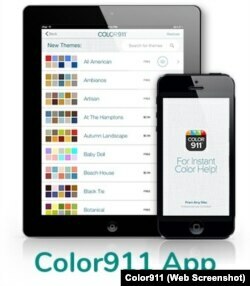 The Color911 app is available for iPhone and iPad for about $4. Additional color themes are available to buy. 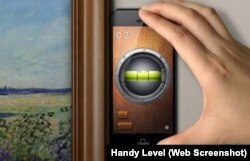 The iHandy Level app lets you measure levels vertically and horizontally with the phone. The app can help make sure everything is placed evenly and straight. One note: be sure to calibrate the level before using it to get the best results. The Home Design 3D app is a powerful tool to help design homes. The app helps users plan building and decorating projects in two and three dimensions. Users can import blueprints and add color and texture to surfaces. The app permits users to place virtual furniture in virtual rooms and virtual cars in virtual garages. Save your plans and share them with others. You can even order 3D prints of your plans. The app is free but it costs about $11 to let the app save your project plans. Communicating clearly is important when planning a home design project. Photo Measures is an app that helps make sure everyone understands the design plans. Take photos of your home, then use them in the app to get started. You can mark measurements, angles and the name of the room on the photos. Mark each wall to have exact measurements you can then share with others. The app will keep these measurements handy when it's time for you to decorate. When you are trying to decide whether a piece of furniture will fit in your room, open the app to see the exact size of the room. The app lets you organize your photos into folders. You can share photos or folders with others if you are working on a project in a team. Have you ever used apps for home improvement or design projects? Have you tried any of these apps? Can you suggest apps to help with home improvement and design projects? Share your thoughts in the Comments Section below or on our Facebook page. This infographic shows seven apps that could help with your next home improvement or design project.